For over 40 years this family-owned, Los Angeles-based company has focused on custom design and craftsmanship, creating timeless handbags, jewelry and coordinating accessories made from the finest materials sourced from around the globe - including leathers from Chicago's Horween Tannery and Swarovski crystals from Austria. At Brighton, creating products that accessorize women stylishly from head to tow is our passion. 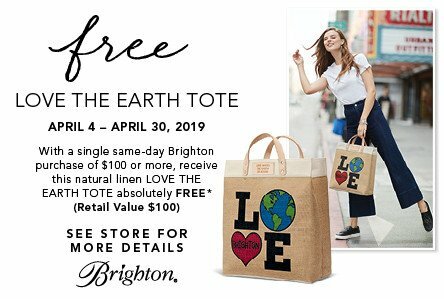 Each season, our diverse and talented design team and artisans create new and modern versions of timeless accessories that are crafted in the unique Brighton manner, so that you can continue to collect fashion-relevant pieces that can be treasured a lifetime. 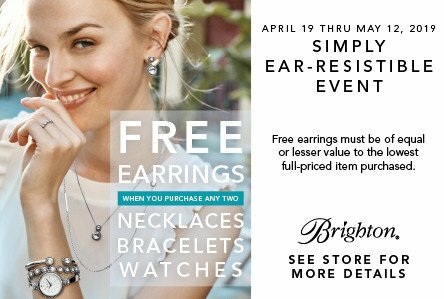 Our SIMPLY EAR-RESISTIBLE promotion offers you the opportunity to easily add to your favorite Brighton Jewelry collection! Buy any 2 Necklaces, bracelets, or watches & get a pair of earrings FREE!! What's more wouldn't a gorgeous pair of earrings make a lovely gift for Mothers Day! !